Before we dive into the customizations found in the PNY GTX 1080 Ti XLR8 OC (“accelerate,” get it?) let's quickly look at the reference specifications from the GeForce GTX 1080 Ti Founders Edition. We tested the PNY GeForce GTX 1080 Ti XLR8 on PCWorld’s dedicated graphics card benchmark system, as usual. Our testbed’s loaded with high-end components to avoid bottlenecks in other parts of the system and show unfettered graphics performance. Intel’s Core i7-5960X with a Corsair Hydro Series H100i closed-loop water cooler ($107 on Amazon). Corsair’s Vengeance LPX DDR4 memory ($127 on Amazon), and 1,200-watt AX1200i power supply ($450 on Amazon). A 480GB Intel 730 series SSD. Phanteks’ Enthoo Evolv ATX case ($190 on Amazon). 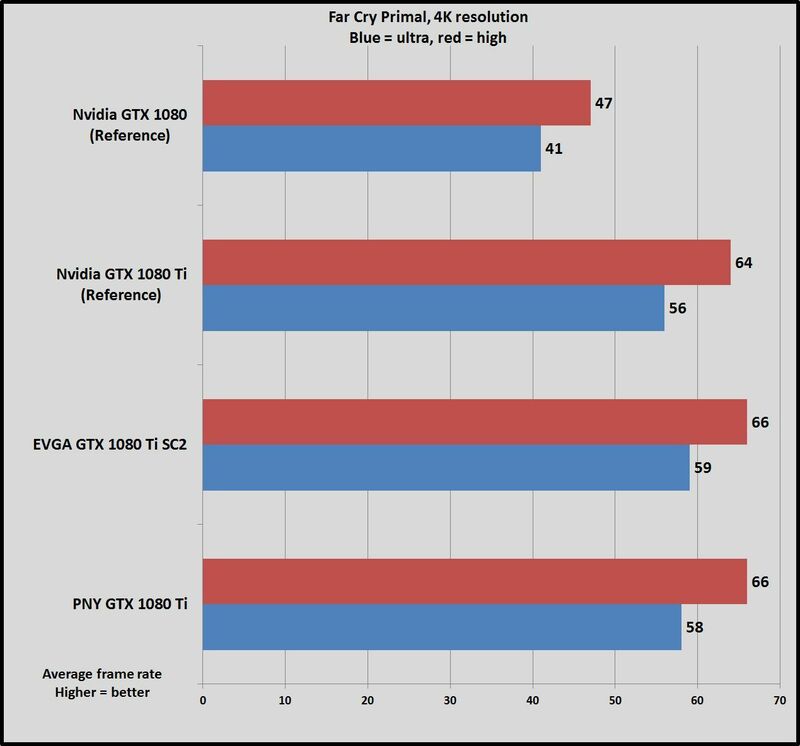 Each game’s tested using its in-game benchmark at the mentioned graphics presets, with V-sync, frame rate caps, and all GPU vendor-specific technologies—like AMD TressFX, Nvidia GameWorks options, and FreeSync/G-Sync—disabled. 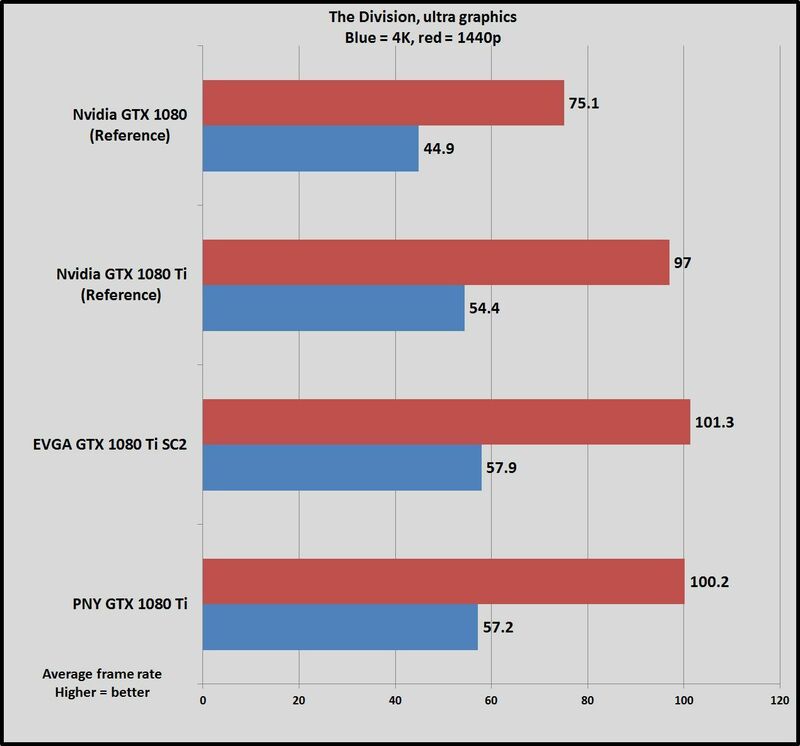 The most recent public drivers were used for testing all cards. 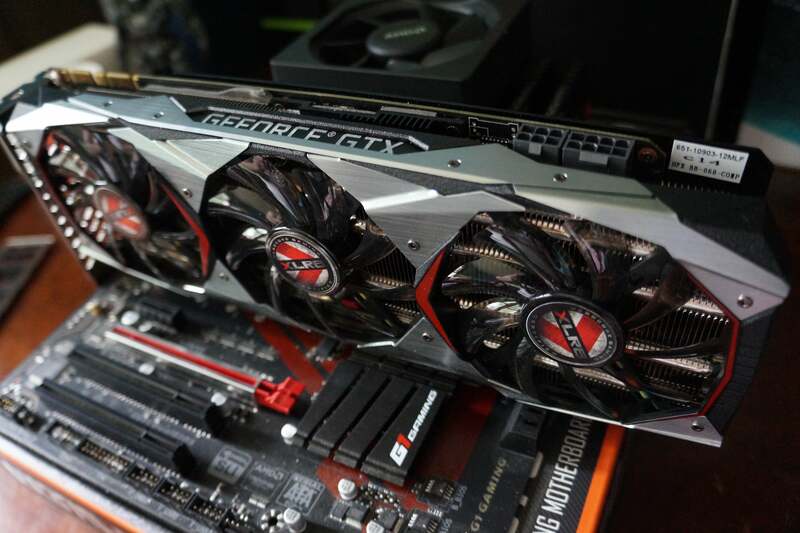 To see where the $725 PNY GTX 1080 Ti XLR8 stands, we’re comparing it against EVGA’s GTX 1080 Ti SC2 ($730 on Amazon), as well as the Nvidia Founders Edition versions of the GeForce GTX 1080 Ti ($700 on Amazon) and GTX 1080 ($550 on Newegg). 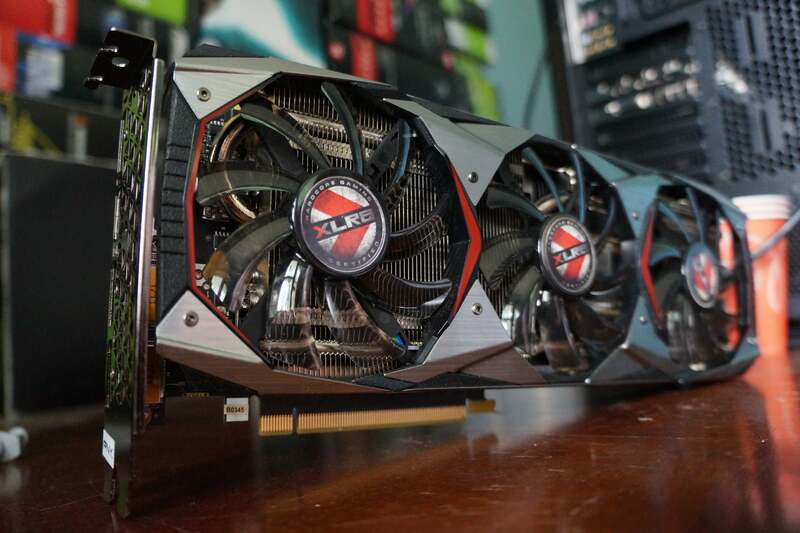 GTX 1080 prices currently appear to be creeping up due to demand caused by cryptocurrency mining. Got it? Good. Let’s get to the games. The Division, a gorgeous third-person shooter/RPG that mixes elements of Destiny and Gears of War, kicks things off with Ubisoft’s new Snowdrop engine. We test the game in DirectX 11 mode. Switching to the tacked-on DirectX 12 mode doesn’t improve performance. 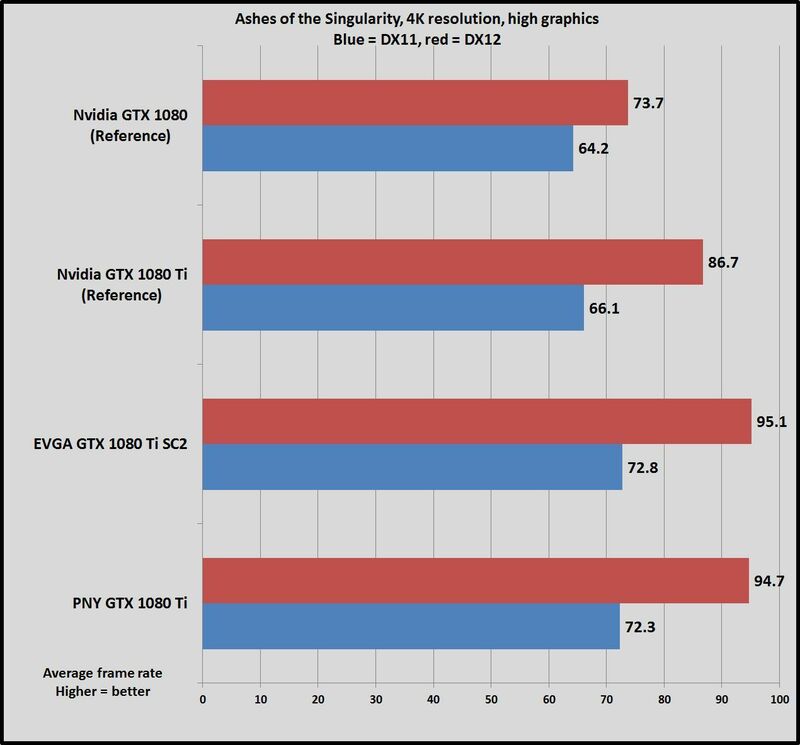 The PNY XLR8 is a wee bit slower than EVGA’s card—imperceptibly so in reality. 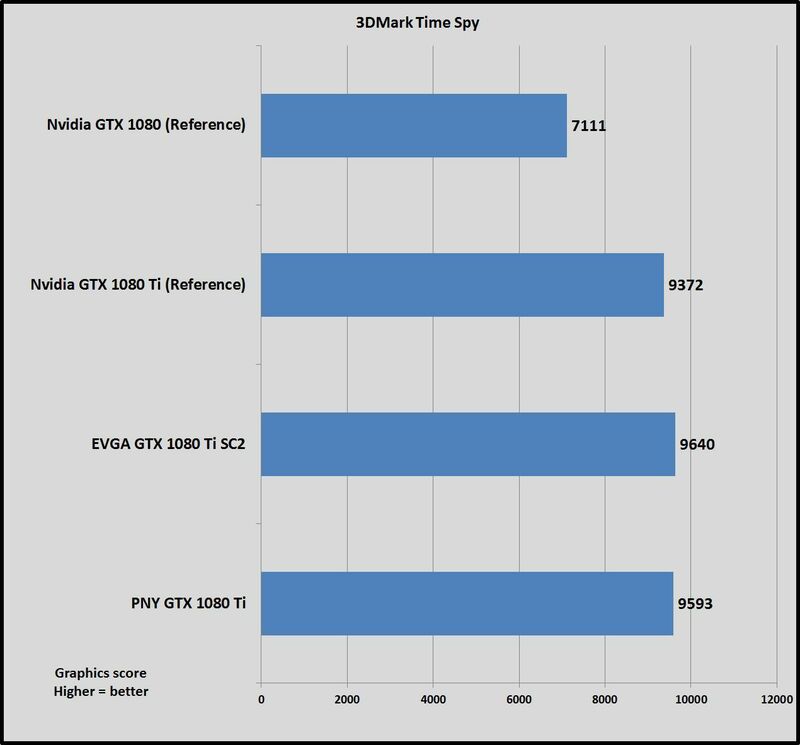 It makes sense, as the overclock on the EVGA GTX 1080 Ti is a wee bit higher than the PNY card’s, at 1,670MHz vs 1,645MHz, respectively. 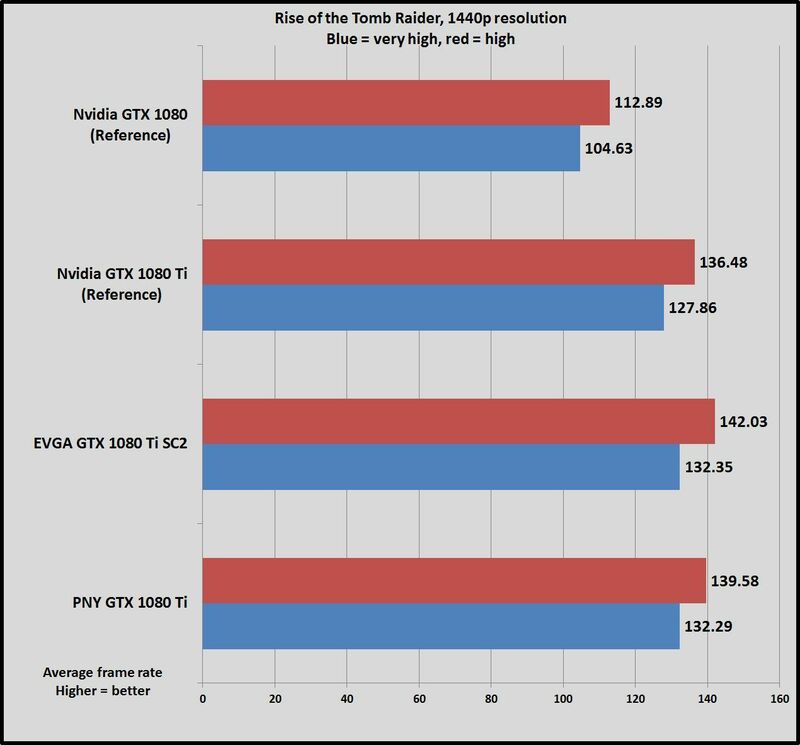 Both are a bit faster than the reference GTX 1080 Ti Founders Edition, which helps them hit the hallowed 60 frames-per-second mark more consistently when you’ve got all the graphical bells and whistles cranked at 4K resolution. 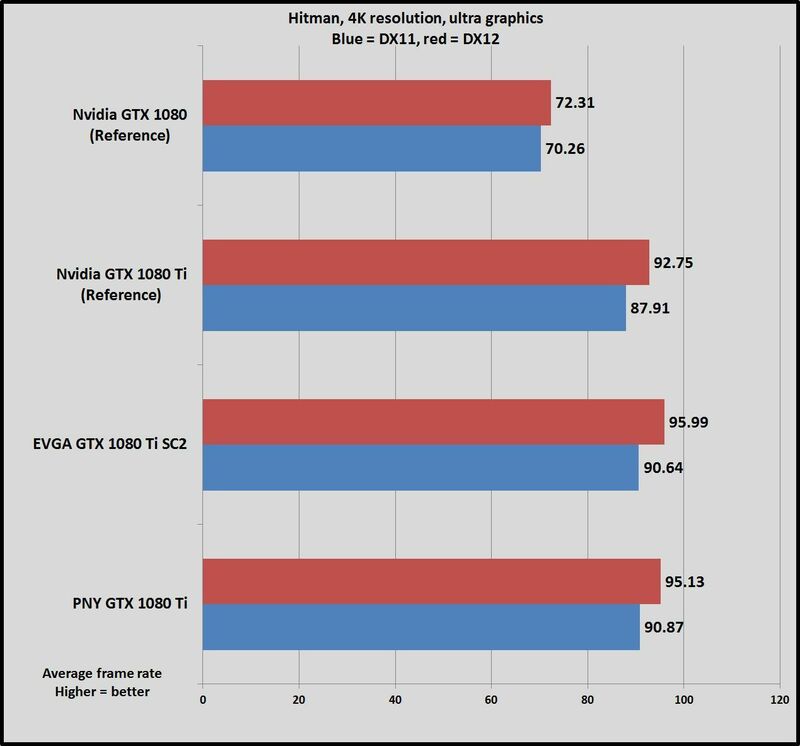 You’ll find similar results in every gaming benchmark test. 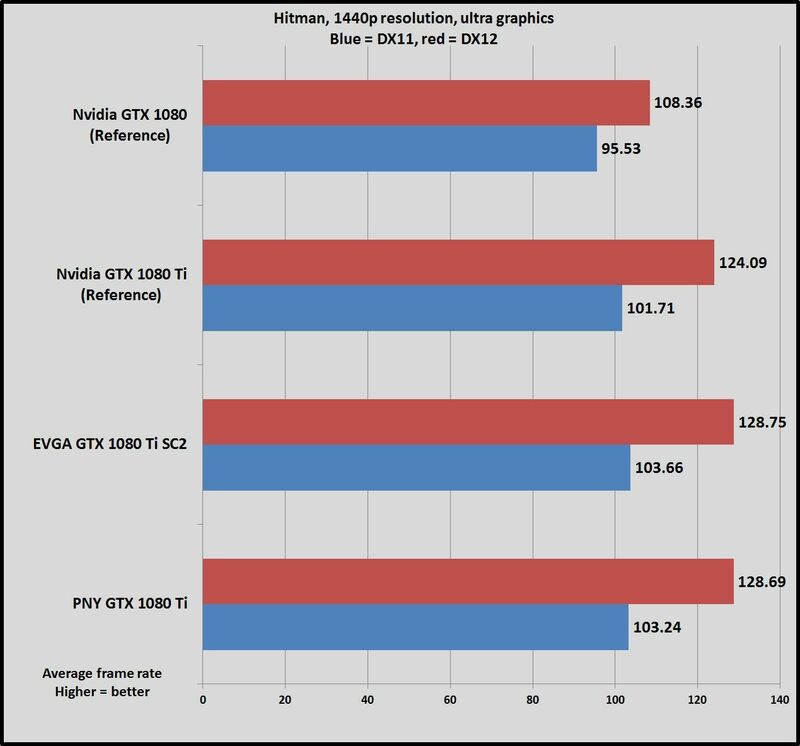 Like I said, customized GTX 1080 Ti cards all perform similarly (and both of these cards, indeed, had no problem overclocking to the 2GHz range). So we’ll leave commentary to a minimum until we get to thermals and power consumption, letting the graphs speak for themselves. Hitman’s Glacier engine historically favored AMD hardware, but GeForce cards keep up better after recent driver optimizations. We test in both DirectX 11 and DirectX 12 with SSAO disabled. Whereas Hitman adores Radeon GPUs, Rise of the Tomb Raider performs much better on GeForce cards—and it’s absolutely gorgeous. We only test the game’s DirectX 11 mode, as DX12 results can be erratic. Far Cry Primal is another Ubisoft game, but it’s powered by a different engine than The Division—the latest version of the long-running and well-respected Dunia engine. Ashes of the Singularity, running on Oxide’s custom Nitrous engine, was an early standard-bearer for DirectX 12, and many months later it’s still the premier game for seeing what next-gen graphics technologies have to offer. We test the game using the High graphics setting, as the wildly strenuous Crazy and Extreme presets aren’t reflective of real-world usage scenarios. We’re showing only 4K results, as the overclocked GTX 1080 Ti is so powerful that the game becomes CPU-bound at 1440p resolution in our rig. 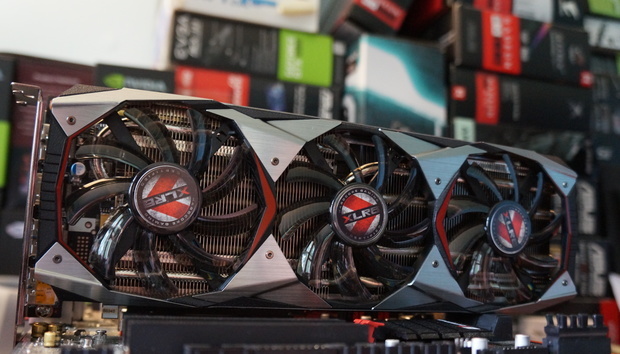 We also tested the PNY GTX 1080 Ti XLR8 and its competitors using 3DMark’s highly respected DX11 Fire Strike benchmark, as well as 3DMark’s Time Spy benchmark, which tests DirectX 12 performance at 2560x1440 resolution. We test power under load by plugging the entire system into a Watts Up meter, running the Division benchmark at 4K resolution, and noting the peak power draw. Idle power is measured after sitting on the Windows desktop for three minutes with no extra programs or processes running. 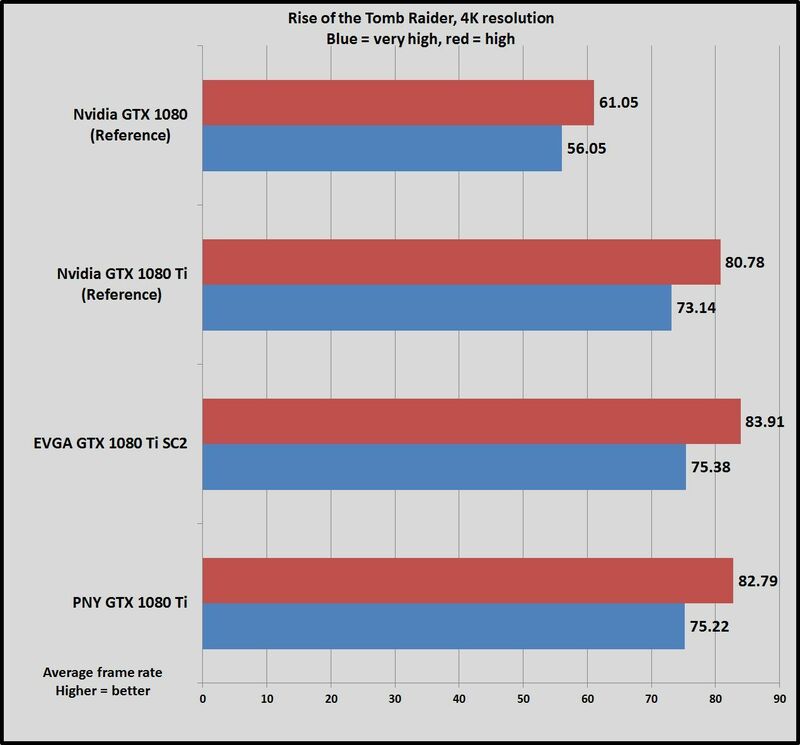 As expected, the overclocked custom cards consume more power than the reference Founders Edition, though surprisingly little in practice. 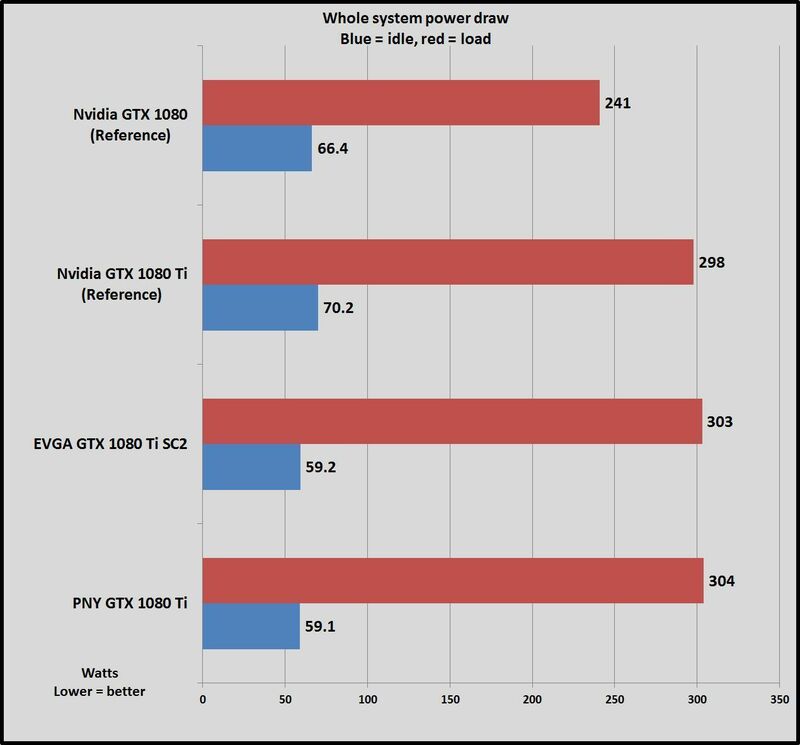 Interestingly, the custom versions consume less power than the GTX 1080 Ti Founders Edition does when idle. We test heat during the same intensive Division benchmark at a strenuous 4K resolution, by running SpeedFan in the background and noting the maximum GPU temperature once the run is over. Here’s where the benefits of a custom cooling solution truly shine. 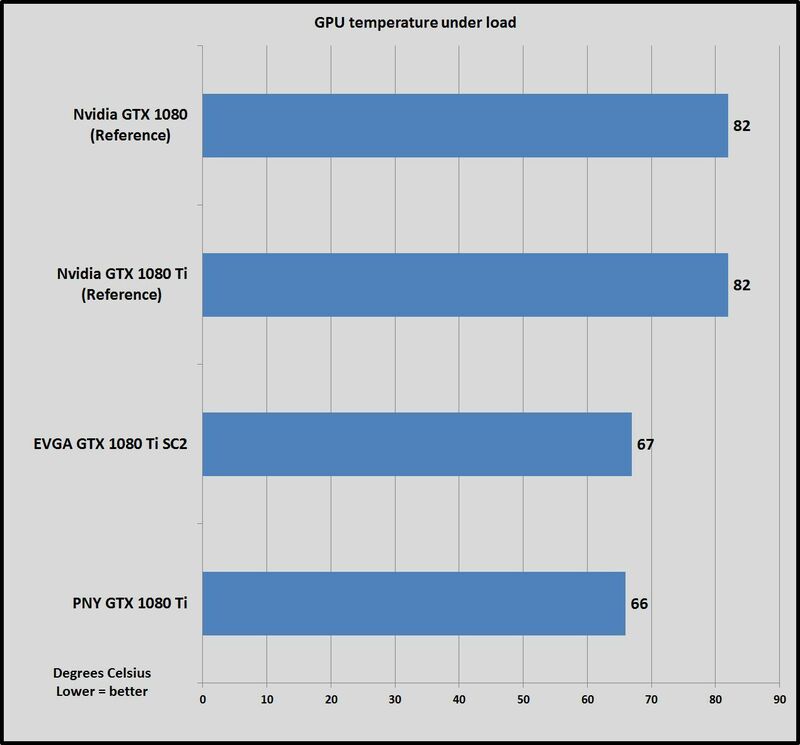 The GTX 1080 Ti Founders Edition runs hot and performs worse than PNY and EVGA’s cards, both of which stay well under 70 degrees Celsius under load despite being far less bulky than most other custom GTX 1080 Ti models. 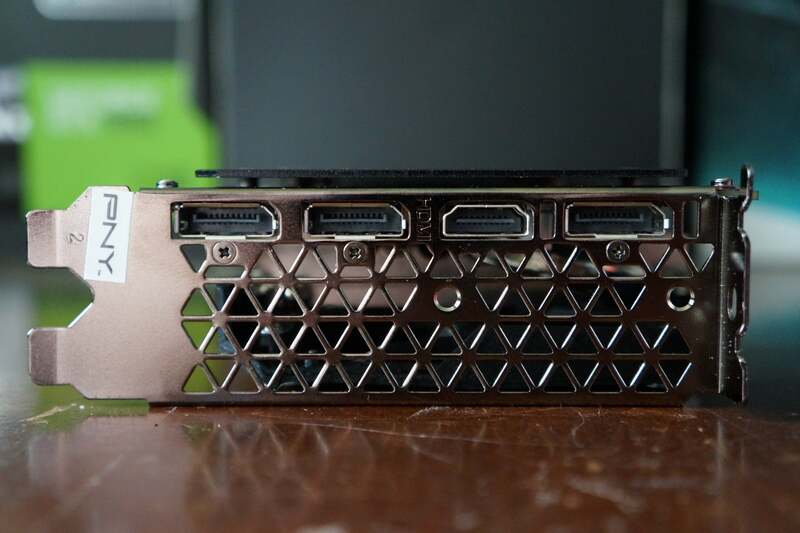 Even though PNY’s card uses three fans to the EVGA’s two, the cards generate similar noise levels to our ears—far, far, far less than the Founders Edition. We couldn’t praise the EVGA GTX 1080 Ti SC2 ($730 on Amazon) highly enough, and PNY’s GTX XLR8 OC ($720 on Newegg) matches it blow-for-blow out of the box in key features. It’s just as cool, just as quiet, and essentially just as powerful. The PNY GTX 1080 Ti XLR8 absolutely chews through games even when you’re using Ultra graphics settings at 4K resolution. Sure, it lacks the EVGA card’s RGB lights and multiple internal temperature sensors, or the dual-BIOSes and other swanky features found on some GTX 1080 Ti cards, but that’s more of a difference than a negative—especially given the XLR8 OC’s appealing price tag. At $720 MSRP, the XLR8 only costs $20 more than the GTX 1080 Ti Founders Edition, and it’s superior in every way. Other custom GTX 1080 Ti models currently on Newegg start at $750, though you sometimes find rebates bringing the total down to $730. Another twist: PNY has recently been selling the XLR8 OC on its website for the same $700 as Founder Edition cards. It’s currently sold out online as a result of that sale, but regardless of which price you pick it up for, the PNY XLR8 offers a lot of extras for a minimal markup. The PNY XLR8 isn’t a sheer bang-for-buck play, though, as the card has some unique selling points. It’s thinner than most custom GTX 1080 Ti cards (although longer as well) and the gorgeous shroud is refreshingly devoid of glittering lights. 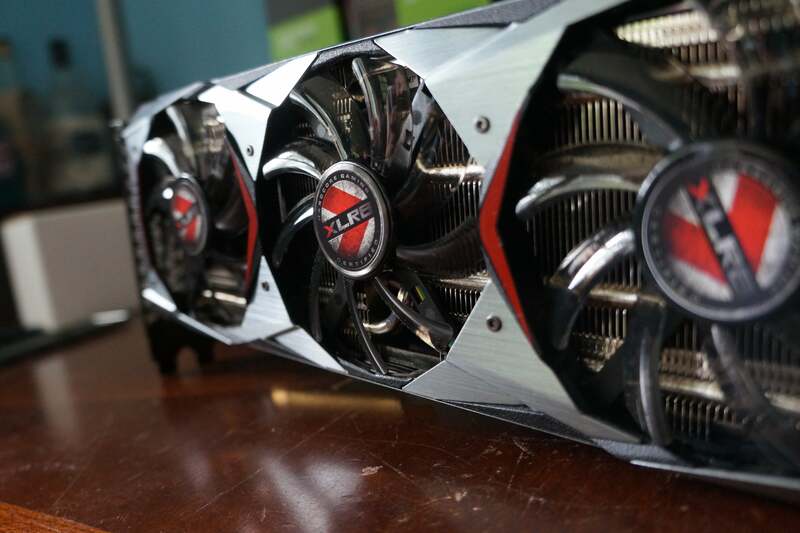 That’s rare in the world of high-end graphics cards—and it no doubt helps keep the price down, too. 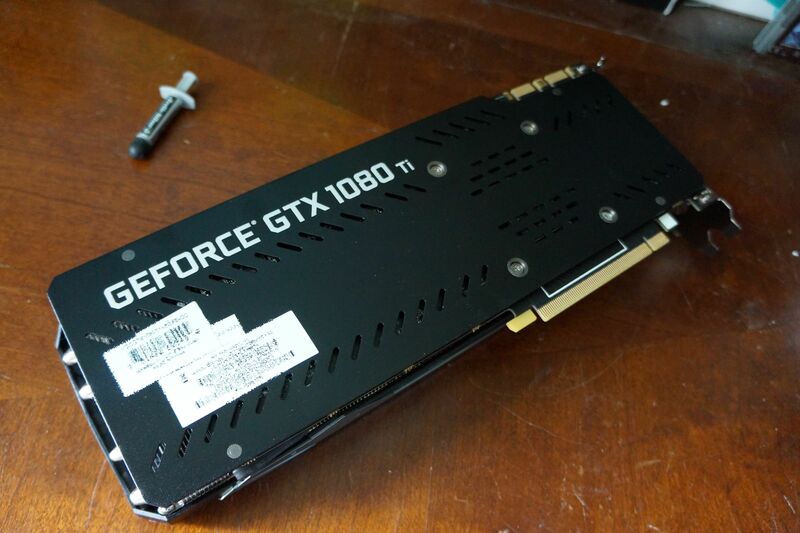 It’s weird calling a $700-plus graphics card a damned good value, but that’s what the PNY GTX 1080 Ti XLR8 OC is. The card runs cool, looks great, and punches hard. It’s a great card to yank out of the box and shove into your system without any further tinkering. No wonder it’s impossible to find any in stock right now, though PNY assures me that more will hit the streets soon.